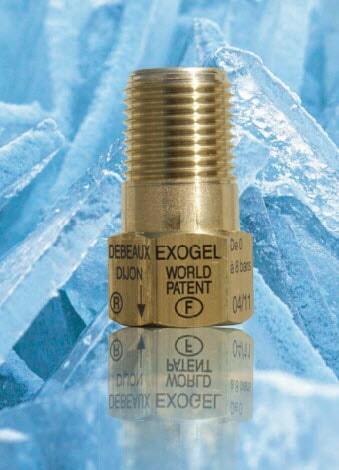 Protect your Hot Water System from freezing in winter with an Exogel valve. SA Hot Water™ are Master Plumbers experienced in fitting this anti-freeze solution to new or existing hot water systems. Installed from $115. Sale price this winter! Exogel Anti-Freeze Pipe and Hot Water System Protection. The Exogel system offers protection of hot water systems and pipes from freezing and bursting, while avoiding any waste of water. When the outside air temperature causes the water temperature in your hot water system to freeze, the Exogel opens and allows water to flow, keeping the pipes clear. Hot waters upstream replaces the colder water in the pipe. All without wasting any water! Once Exogel detects a higher temperature, it closes and is ready for a new cycle. The main economic benefit is the avoidance of significant plumbing costs in replacing damaged pipework. There is also no ongoing maintenance required for the system. Install once, job done! Particularly advised for Solar Hot Water Systems to prevent freezing of the inlet pipes, protecting your investment in Solar Hot Water. There are no water losses or electricity costs incurred. The main benefit to the householder is the uninterrupted operation of the hot water system in cold weather. Exogel can protect up to 50 metres of pipe work. It is independent of any other system and can be installed on a purely preventative basis. No electricity required. When the ambient temperature drops to near zero the Exogel opens and allows water from the warmer part of the system to flow, preventing freezing. The Exogel valve comprises a thermostatic element exerting pressure on a valve preventing water flow when the temperature is above 1°c. As the temperature drops the pressure in the valve decreases allowing water water to flow. When the temperature of the water reaches 4°c the Exogel valve closes, ready for another cycle. The Exogel valve works according to the water temperature in the hot water system and not the air temperature. Exogel Anti-Freeze Protection Best Price!